January 2014 - done, over, gone.... I can't decide if it happened fast or slow. No, it was slow. It was a long month. I felt very busy most of the time. I did get some stitching done, mostly thanks to sports on TV - so I do have some stitching updates that I can share. 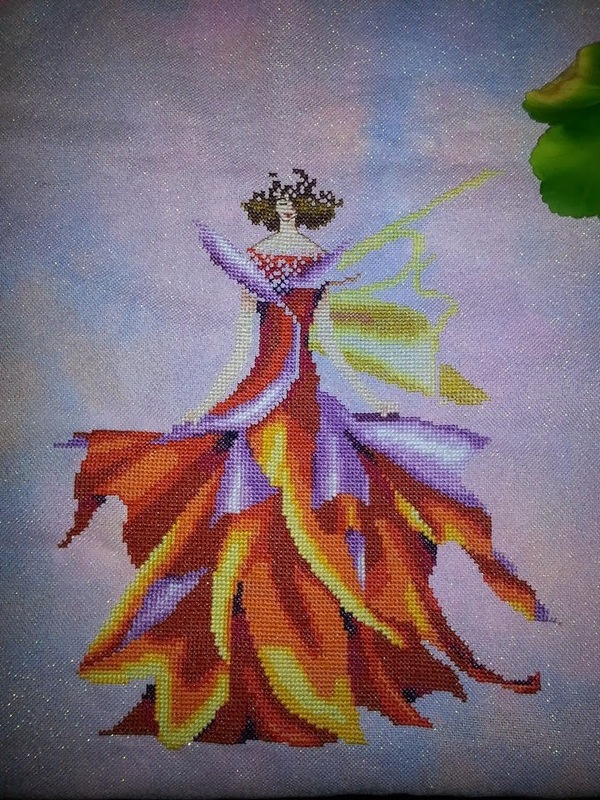 I am still working on Fairy Autumn Glow by Nora Corbett. She is being worked on at lunch hours at work now. 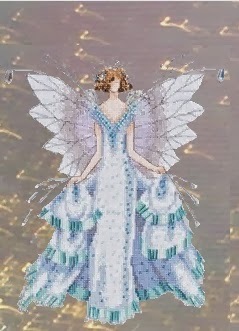 I have the dress completed and I'm working on her wings. I have decided to stitch the wings with 1 thread instead of 2 and I have added some glisten gloss for sparkly effect. 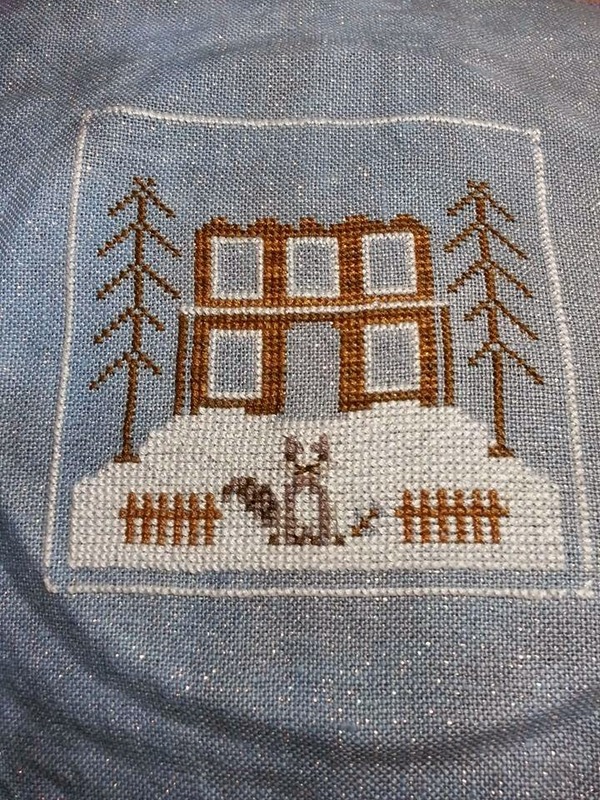 I have started to work on Frosty Forest by Country Cottage Needleworks. This is a series of nine patterns that feature adorable little animals of all sorts. I started with Raccoon Cabin. This project is stitched on Foggy Morning Opal linen by Crafty Kitten. Finally, I have decided my large Mirabilia start for the year will be Persephone. 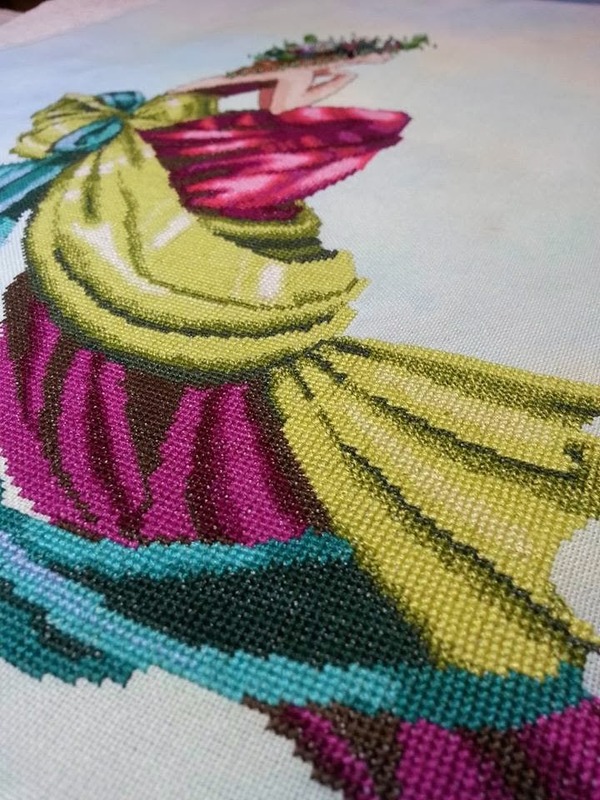 To me, this pattern really embodies the brand of Mirabilia - she is regal, beautiful, amazing colours...and a first by Mirabilia this pattern features gorgeous wall paper behind Persephone which is stitched in variegated silks. After looking at about ten different fabrics I chose Apricot Blush by Crafty Kitten to stitch her on. Progress 01/30/2014 - photo colours are washed out. 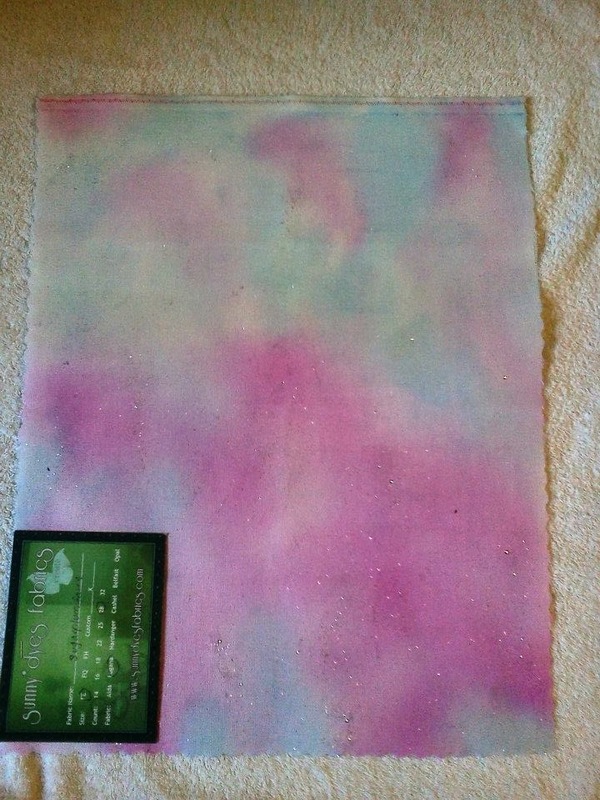 The background is slow going - and I frogged a bunch - but I love the effect and I am already proud of this project. I can't wait to get more into it! 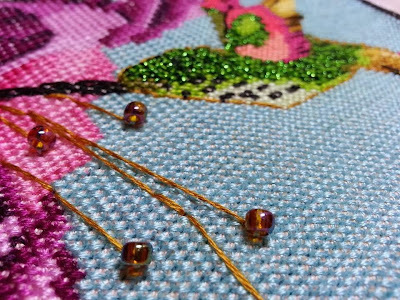 Next week I am going away for a weekend with friends to stitch and I am sure I will have a lot more to share. I have my Pam Kellogg kitty all ready to go for a fresh start for that weekend. 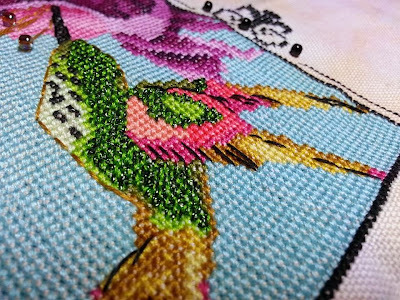 This is a stitching blog - but it is my only blog and today I want to use it to tap out some thoughts. You see today is Independence Day. 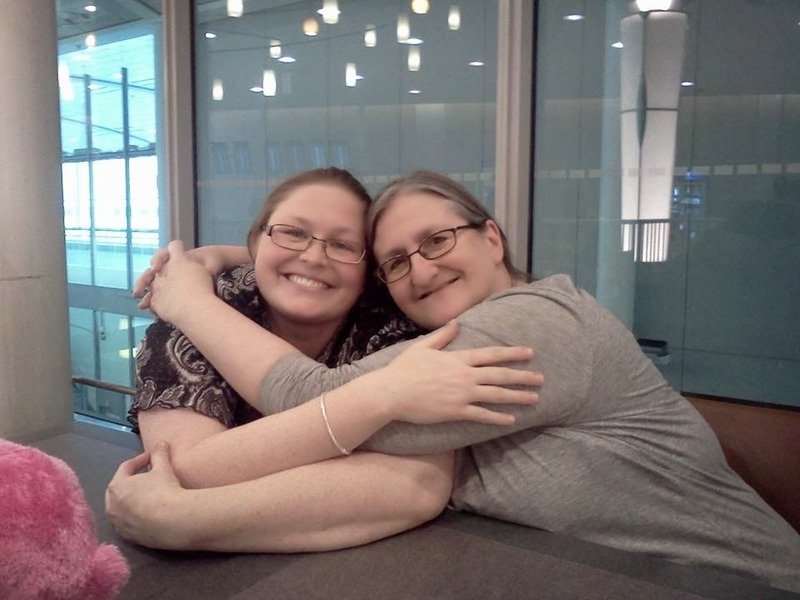 One year ago today, on January 14, 2013, me and my two little girls got dropped off at the airport and boarded a plane to leave Calgary and return home to New Brunswick and start over again. This day is feeling a tad odd. I'm feeling strong and powerful and accomplished and yet a bit melancholy. Myth: One year ago today I thought I had lost everything. Fact: One year ago today I reclaimed myself. One year ago today was an odd day - not only was I travelling solo with a eight and a six year old but it was the day I got to meet my best friend in person for the first time. Let me explain... Facebook has allowed me to make some amazing friends. Friends that my connection and trust runs deeper than with some people I have met in real life - these friends are scattered over the corners of the world - Australia, Sweden, North Carolina...and Toronto to name a few. Lucky for me, Toronto was where I had a four hour layover. Sharon took a day off work and allowed her grandson to take a day off school to come and meet us at the airport that day. I needed her so badly. I might have looked like I had it together that day but I was falling apart with uncertainty. Seeing her just really was a relief - she was so familiar and comforting and it wasn't at all like a first meeting. She did the kindest thing by just being there, but she also brought gifts. She gave me my Pandora bracelet. She said it represented new beginnings and I really do associate my bracelet with a fresh start and it represents everything I love - my family, my friends, myself... I cherish it but not nearly as much as I do the friendship that brought me through all of this. My life has come beyond full circle. Circle kinda indicates you are back to where you started. That isn't what happened to me. I experienced great growth this past year. I have learned my true strengths and weaknesses. 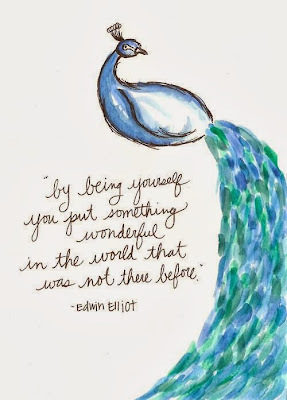 I found who I am and what I like and love and want in my life. I ask permission a lot less. 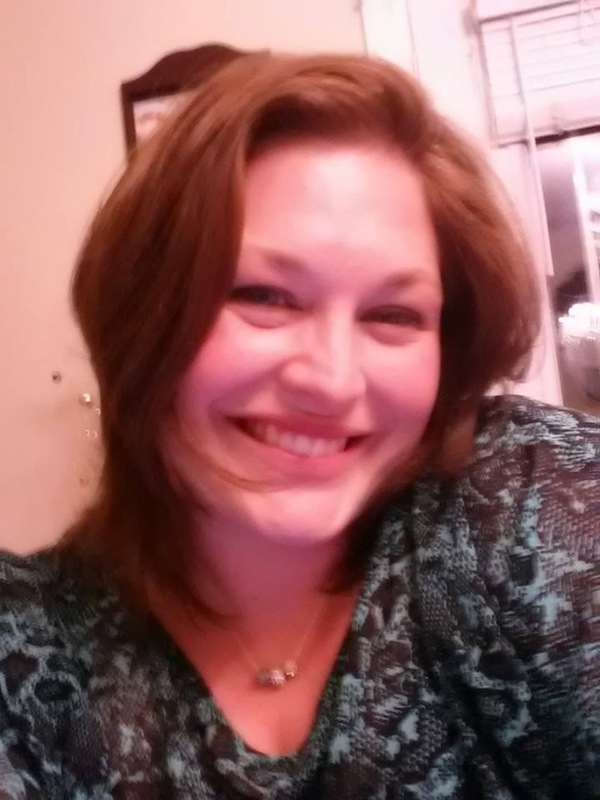 I feel kinder - lighter - literally (I lost 20 lbs over this past year). I'm a better employee - I think I'm a better mom. I hope I'm a better friend. 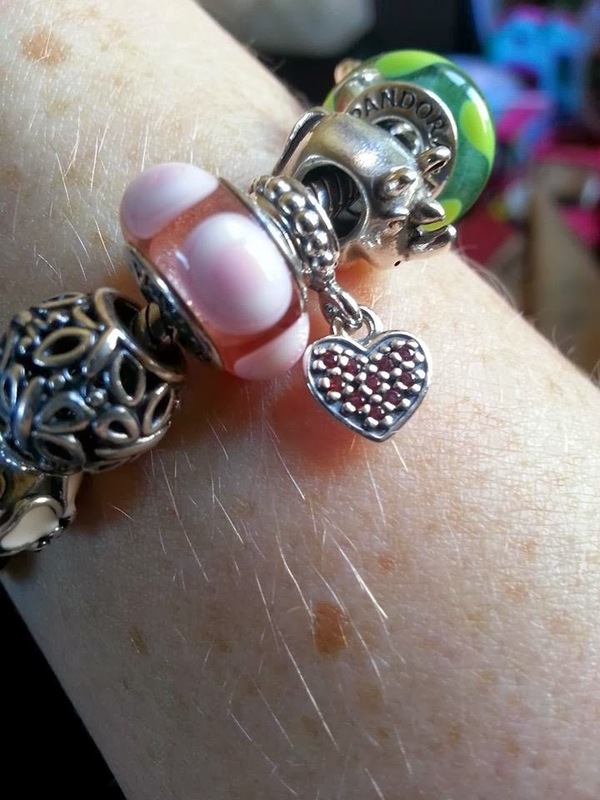 A few of my charms - green bead represents the little boys in my life, rhino is my totem, heart is with love from John, the pink represents the little girls in my life, the butterflies represent flying free and was from my mom...all my charms mean something to me. But, I'm not done yet. I have a way to go. Still need to make things all official and legal but none of that is the important stuff. What is important is learning to be yourself - accepting your flaws and weirdness and scars and saying "well here it is..." Let someone who sees it all love you. The result can be amazing. So, Happy Independence Day to me. Right now, I'm feeling less melancholy and more proud of myself. When I told John what today was he gave me a tight hug and just said "Welcome Home." How perfect. xo. Welcome 2014! I am so ready to start this new year off. So many great challenges and wins happened for me in 2013 but I am looking forward to starting this year off fresh while being content, happy and in love. 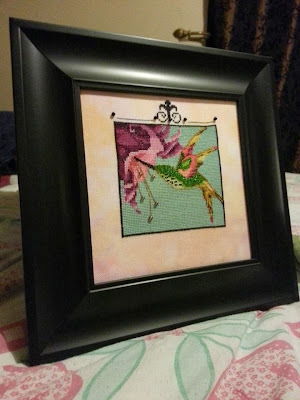 I want to thank you for stopping in and reading my blog and sharing my stitching with me. I do love stitching there is such a therapy about it that only stitchers really get. 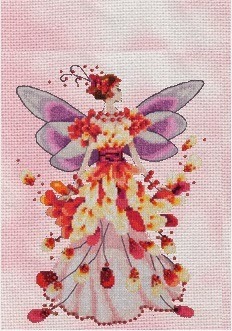 I am planning do do all four of these seasonal faeries on an opal fabric. Right now I am contemplating wings or no wings.... before I decide I am going to do the full dress and maybe even the beads to see how it feels. Here are the mock ups I have for the other three fairies. Thanks for help from the Design and Fabric Viewer I was able to find fabrics that I feel coordinate well. 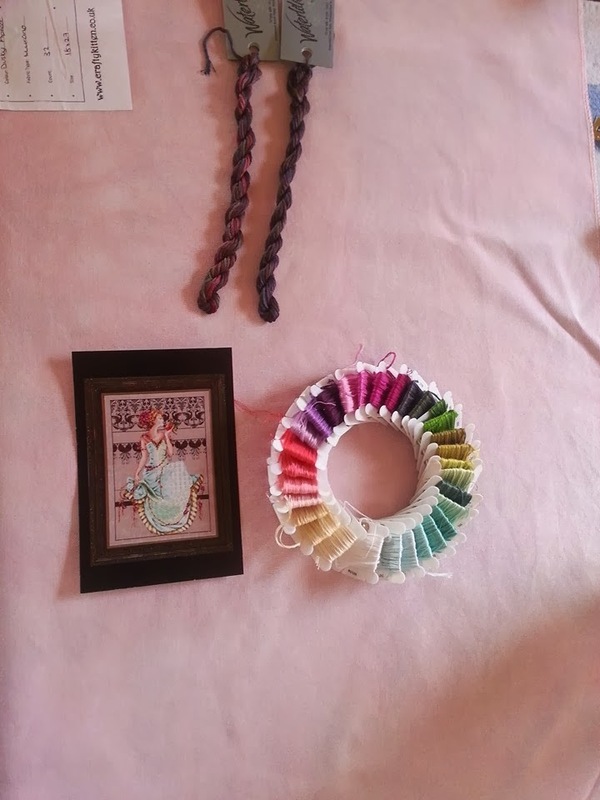 Now I have to say the viewer does not have an accurate photo of Sugar Plum Fairy by Sunny Dyes - here is a picture of the actual fabric I am going to use....eventually. After Autumn Glow I would like to start another full size Mirabilia. I am teetering between Lilly of the Woods and Persephone. I also have plans to go away and stitch for a weekend coming up with some friends. We are going to do a new start on this weekend away and only work on it while we are together. 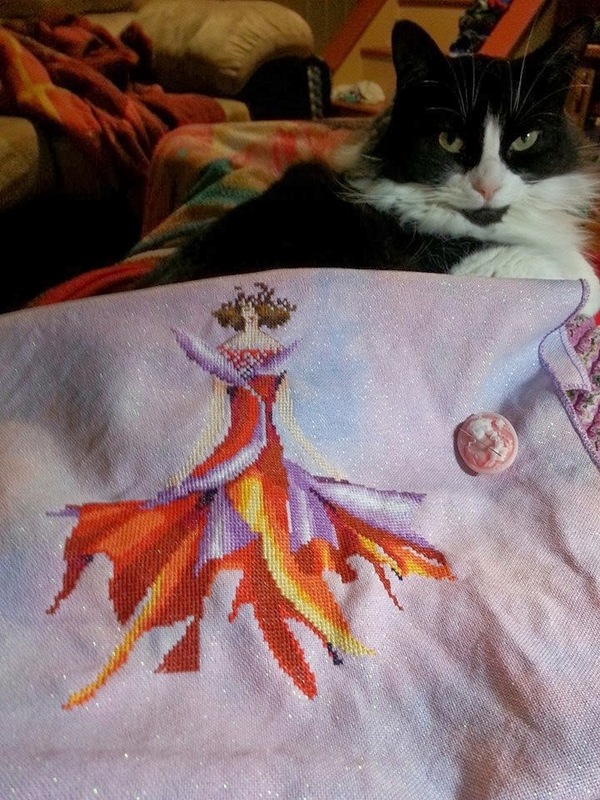 I believe I am going to start a design I was gifted for Christmas by my friend Katy with a design by Pamela Kellogg called the 2003 Autumn Mystery Sampler... which looks very much like my Bella! Mirabilia - Nora Corbett Group or Pick A Pixie! 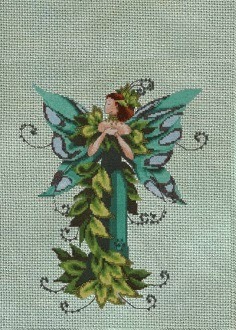 Nora Corbett Pixie SAL (for any smaller Nora designs) to share your work and see what others are up to! "This treasure of cross stitch is a symphony of fuchsia, teal and lime. The pose is one of elegance and quiet contemplation. The simple flowing satin shows a subtle sheen and give this piece and Art Nouveau feel." I started Charlie in September when I was looking for something bright and colourful to work on. 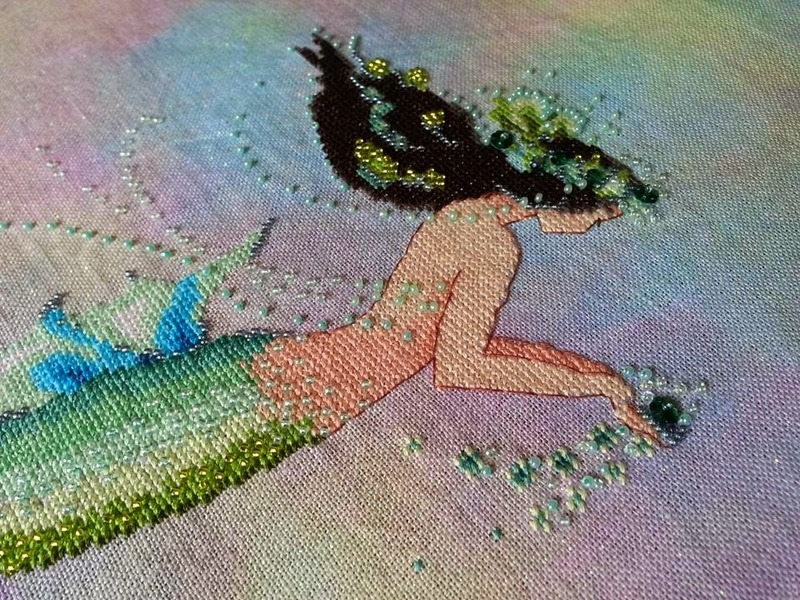 I never actually thought I would stitch this pattern and had her as a part of my overall collection, but the day I was flipping through my book she just cried out to be stitched. So I decided to give it a go. It was a very enjoyable pattern to work with - deceivingly big. 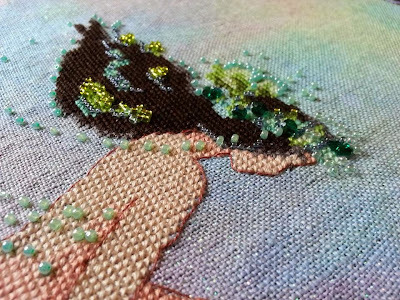 No Kreinik or metallics in her. I made a few changes (of course) I did an open eye and I used some beads from BeadFX to embellish her hair. Charlotte by Mirabilia stitched on 32 count murano Sunlit Pool by Crafty Kitten. 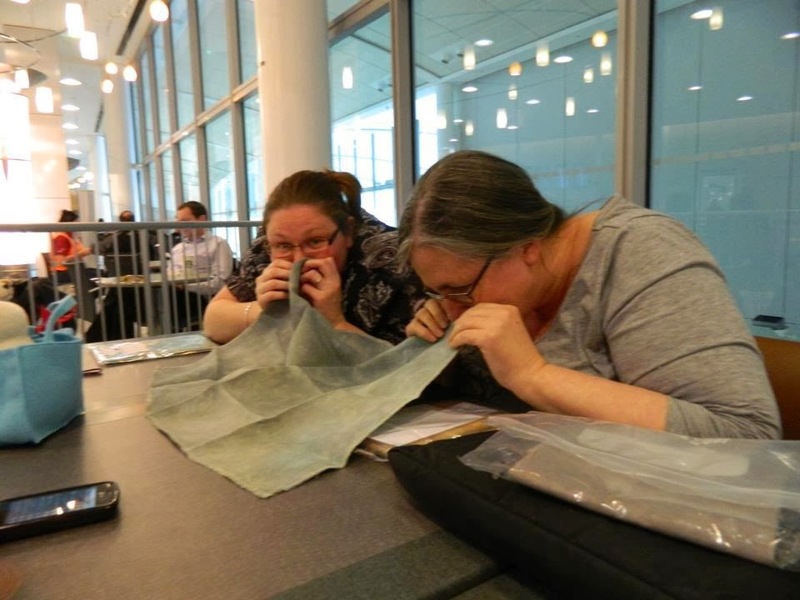 The lighting in this photo suggests a greyish tone - however, the fabric is mostly greens, yellows and a soft bit of blue. 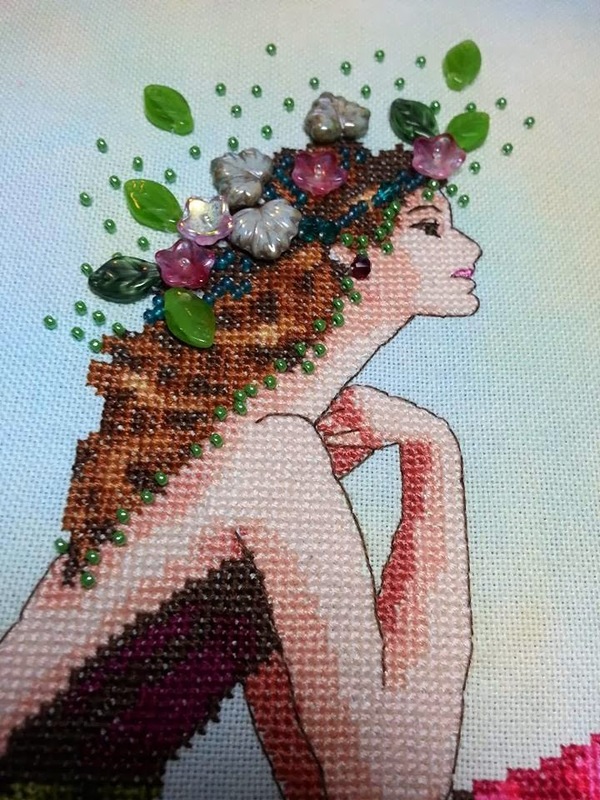 Stitched with an open eye and changed her hair treasures to beads I had purchased at BeadFX. 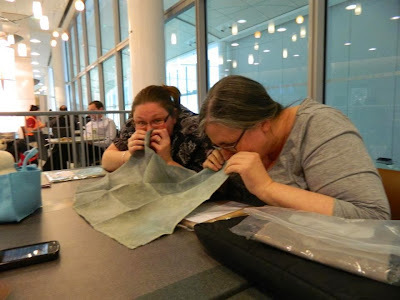 This picture if more representative of the fabric colour. Another view of her face and beads. Now that 2014 is here I have decided to start a smaller pattern. I am doing Fairy Autumn Glow by Nora Corbett. I am also awaiting some fabric and fibers to do the Frosty Forest series by County Cottage Needleworks. For most stitchers that I know, there is a rush to the finish when a year comes to close. I think there is many reasons for that. For me it is the satisfaction on getting closure on a project and allowing yourself to start something new without that nagging feeling that something was left behind. 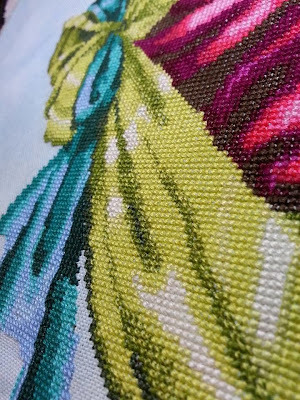 I have a few finishes to show you to cap off my 2013 year of stitching. First up is Nora Corbett's Hummingbird. This is part of the Audubon Street Collection. I suspect there will be six patterns in total with as of date (01/02/2014) four being released. 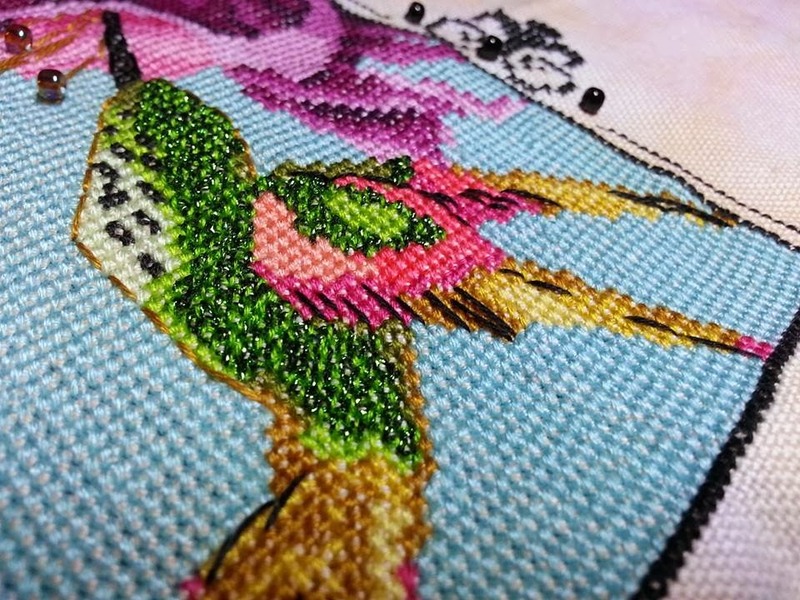 I have always loved little song birds and my goal is to do all six of these pieces on one fabric. 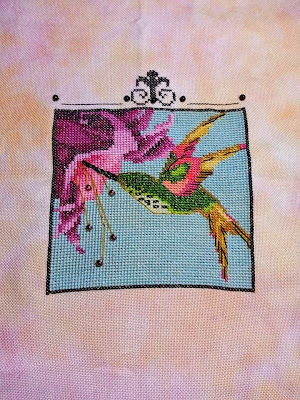 I did Hummingbird as a Christmas gift for my step-mother and my father as their property is swarming with hummingbird activities during the summer. 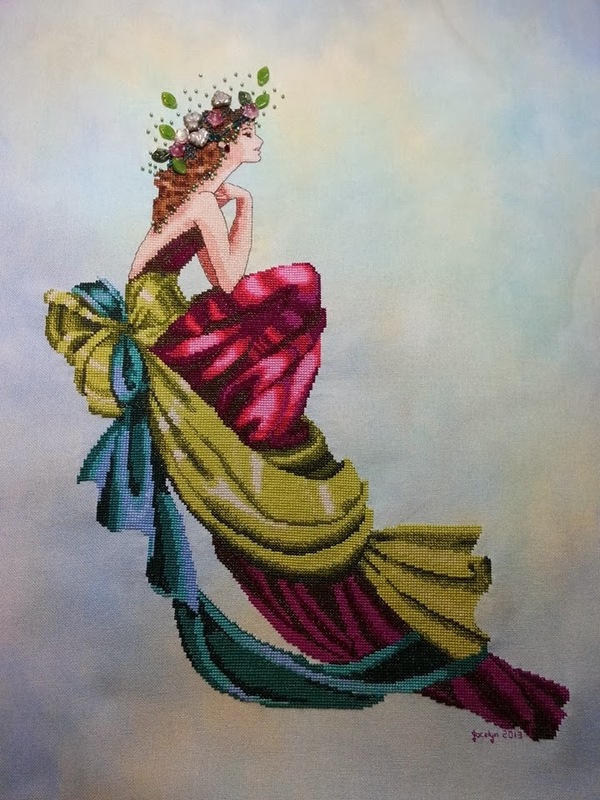 It was stitched on an early piece of fabric by Hand Dyed Fabrics By Stephanie which doesn't have a name. 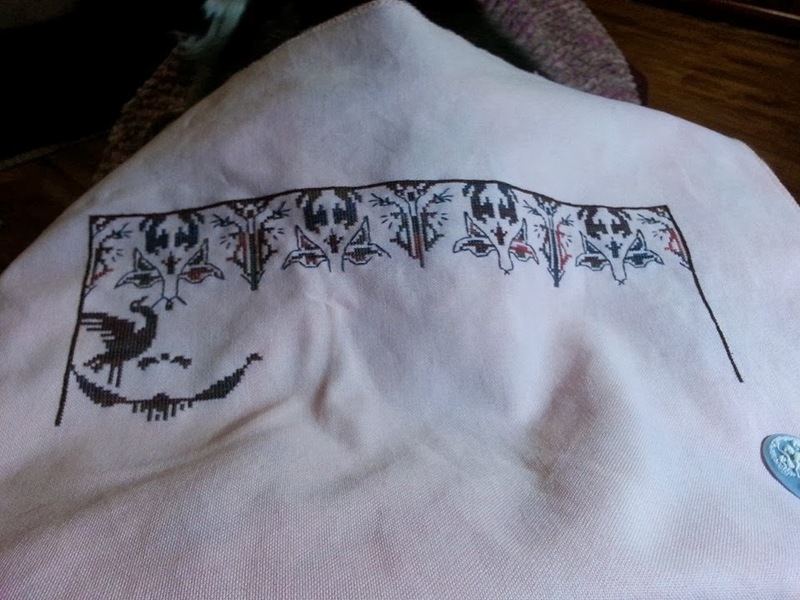 I simplified the border, choosing only to do the scroll work on the top of the pattern. 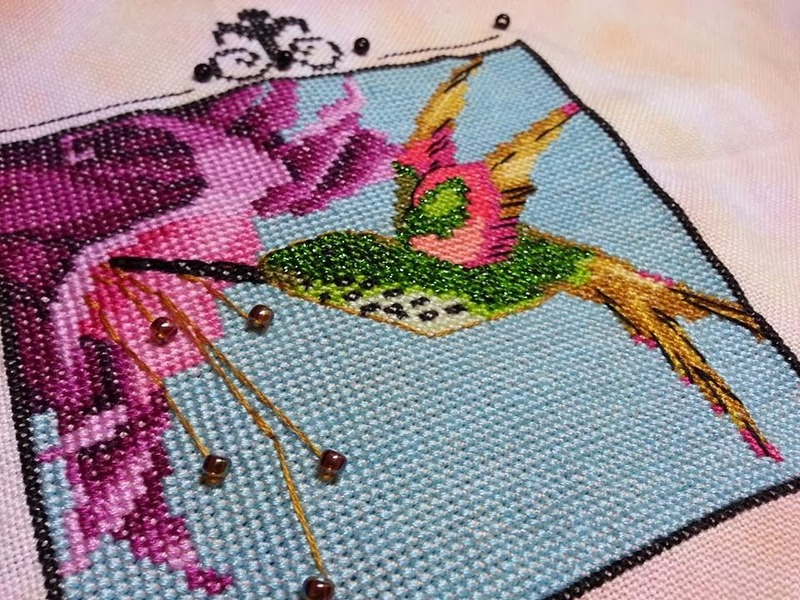 The colours are fun and lively and the bit of Kreinik in the bird makes him sparkle like a real hummingbird does. 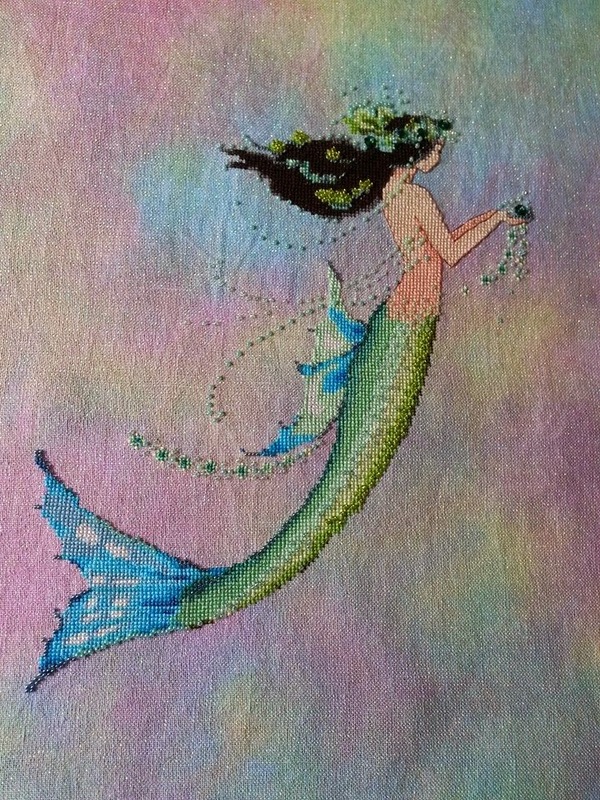 I also managed to finish, to my surprise, Mermaid Azure by Nora Corbett. This little siren of the sea is sassy and sweet at the same time. 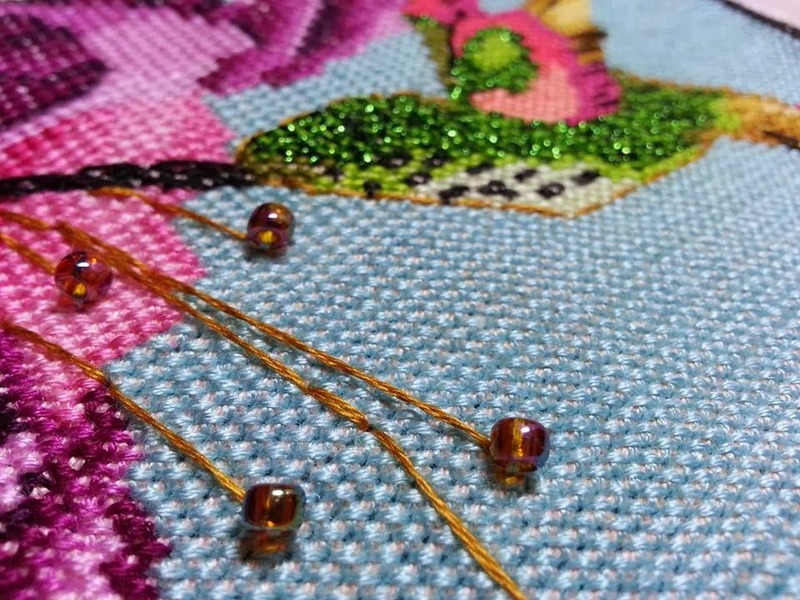 I was hoping to finish stitching only pre-New Years Eve and I just started beading on Dec 29th until I was done. Wow - that was a lot of beads. Azure is stitched on a gorgeous piece of 32 count opal belfast linen called "Tropical Breeze" by Crafty Kitten. Linen and I are not that friendly. 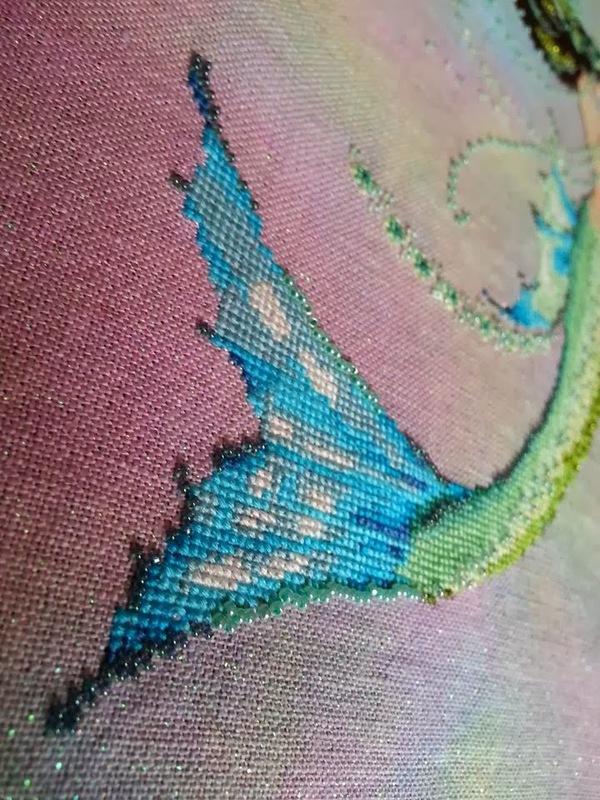 I manage but it isn't my favorite nor fastest fabric to stitch on. With that said, the colours in this opal belfast are to "dye" for and I just needed to have it in linen. I love this photo - great example of colours in combination. 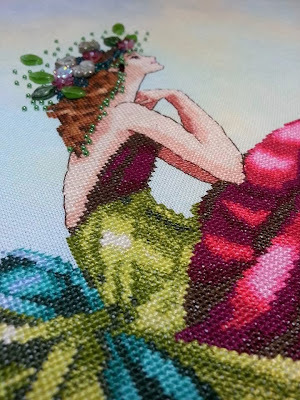 There are so many beads in this mermaid. I really can't capture just how lush she is. 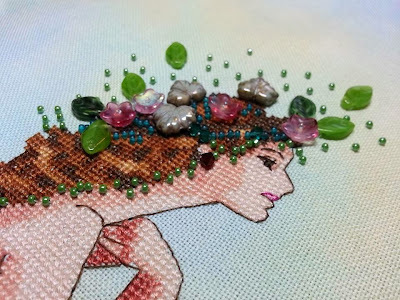 She has seven Mill Hill treasures on her and five different colours of beading. So there we have it. Two more finishes to 2013. I have one more big one to add before we start the New Year fresh! Stay tuned for Charlotte!